Not long ago I bumped into another American father in town, cradling his newborn daughter. His other two children, of elementary school age, were playing nearby. As we talked about our children, and naturally touched on our efforts to support the development of their minority language—English for us—it became apparent that he was feeling some frustration over the fact that his older kids seem to understand his English, for the most part, but typically respond only in Japanese. I’ve lived in Japan since 1996 and I’ve seen this situation over and over and over again: despite the parent’s high hopes, the child won’t speak the minority language. Why does this happen, and what can be done to address it when it occurs? Recently, I wrote a post entitled Warning to New Parents Who Dream of Raising a Bilingual Child. If you haven’t seen it yet, I urge you to read it and share it with others who are just beginning the bilingual journey. That article, I hope, can help spare some parents the frustration felt by many when it comes to the development of the child’s minority language ability. If you want your children to use both languages actively when they start to speak, you must hit the ground running, right from birth, and do all that you can—day in and day out—to ensure that they form an organic need to use the minority language and receive sufficient exposure to that language. When a child starts speaking, yet comes to rely mainly on the majority language to communicate, her reluctance to use the minority language can generally be traced to shortcomings in these two key areas—need and exposure—during the first few years of life. This period, when the young child’s brain is building the foundation for future communication, is a vital time for firmly supporting the minority language. This is why, once my children were born—and bear in mind that I’m not the main caregiver—I was determined to speak as little Japanese as possible when they were within earshot, especially as babies and toddlers. It’s true, my own Japanese ability has suffered, but it was far more important for me to convey the idea that I could only speak the minority language. In this way, they would form a real need to communicate with me in English. If your children have already come to realize that they needn’t use the minority language with you—and that using their stronger, majority language is “easier” for them—altering the pattern of communication that has been set will likely require more than simply insisting that they speak to you in the language you wish. I understand the deep desire to communicate with your own children in your native language (see Why Communicating in English with My Kids is So Important to Me)—and being firm may bring some results, depending on the family dynamic—but if you really want to “activate” their passive language ability, you should also vigorously address the lack of need and exposure. Again, an organic need is crucial for motivating their use of the target language. If, at this point, you’re unable to create a genuine need for your children to speak the language with you, look elsewhere to shore up that need. Seek out monolingual settings and situations where they will have no choice but to communicate in that language: schools, clubs, tutors, family members, babysitters, other children, homestay guests, homestays for them, trips, etc. Be proactive about this—don’t just assume that such opportunities aren’t available to you. The more you’re able to build this real need into your children’s lives, the more they’ll start using the language. At the same time, you should make every effort to increase the amount of meaningful exposure your children receive in the target language each day. In my experience, most families facing the problem of passive ability in the minority language aren’t providing their children with enough exposure in that language on a regular basis. What’s “enough exposure”? I discuss this question in detail in How Many Hours Per Week Is Your Child Exposed to the Minority Language?, so I urge you to read that post. A good target, though, would be about 30% of the child’s waking hours, or roughly 25 hours a week. Along with the opportunities for interaction that you’ll hopefully create when you address the lack of need, I strongly suggest that you increase your children’s exposure to the minority language in a wide range of ways, including books, conversation, music, media, and games. When it comes to nurturing language development, books and reading have tremendous power. If you’re not already reading aloud to your children every day in the minority language—for at least 15 minutes a day—you’re not taking advantage of the number one way to boost their language ability. Make a vow, right this minute, to build a home library of suitable books and read aloud to them each day, whatever their age. Also, at Free Report: The Power of Reading in Raising a Bilingual Child, you can download a handy PDF file which summarizes my thoughts on reading. Along with daily reading, make an effort to increase the sheer volume of speech you direct toward your children in the minority language. (See The Most Powerful Thing of All in Nurturing Language Development for a fuller discussion of this important principle.) Even if they aren’t responding in that language, right now, this additional exposure will help pave the way for communication. As for TV, I’ll admit that TV programs and DVDs have long played an important role in my children’s exposure to the minority language. At the same time, I do try to limit this input since the passive exposure of TV can’t match the positive impact of more interactive experiences—and, besides, I don’t want my kids turning into glassy-eyed zombies. In the end, activating a child’s passive ability in the minority language will depend on the actions you’re willing, and able, to make. If you can adequately address these areas of need and exposure, you’ll likely see signs of progress. It may be, however, that in your particular situation, at this particular time, you’re unwilling or unable to take action to the degree needed. There’s no shame in that. It then becomes important, though, to modify your goal and feel at peace with the idea of supporting your children’s minority language to whatever extent you can. Never permit yourself to get to the point where, out of discouragement, you just stop trying. Remember that every effort you make can have a positive impact on your children’s language development and their longer-term future. Even if you don’t see the fruits of your efforts right away, the actions you make now could very well lead to the day when your greater goal is realized and your children come to use the minority language more actively in their lives. In other words, it’s never too late to keep trying. At the same time, go at this as lightly, as playfully, as you can. The bilingual journey, for both you and your children, should be more joy than burden. I understand the frustrations that can come with supporting the minority language (just ask my daughter), but we can’t let those frustrations weigh on our day-to-day relationships with our kids. After all, from the child’s point of view, being loved will always be more important than being bilingual. 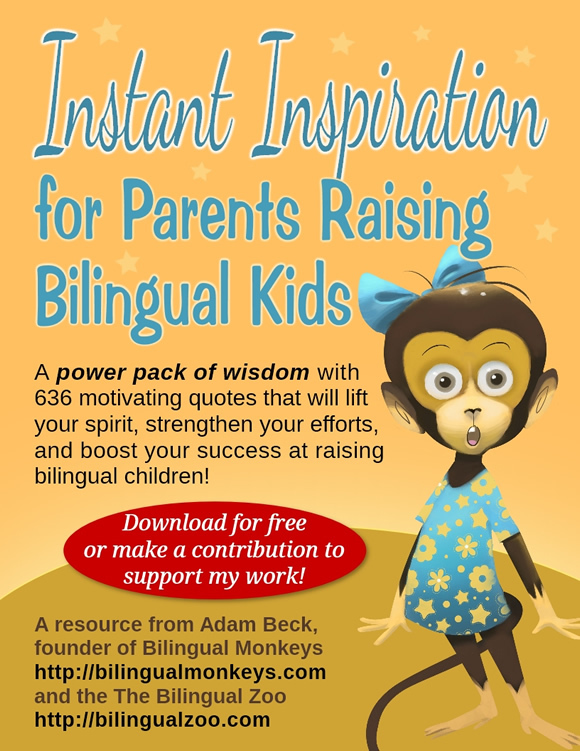 To lift your spirit, and boost your success, get my free eBook Instant Inspiration for Parents Raising Bilingual Kids. How about you? If you want your children to use their minority language more actively, what more can you do to address the areas of need and exposure? Hi! I really like your website. I’m having the opposite problem though. I live in Jordan and speak English almost exclusively with my 3 year old, and have since he was born. I have him in an Arabic pre-school, and regardless, he is having a load of trouble with Arabic. He knows his numbers and letters, but is way behind in speaking and listening in comparison with his peers. Ideas? Elizabeth, during my teaching time at Hiroshima International School, I encountered many preschool children who had very little ability in the language of the school (English, in this case) when they first arrived. Every child is different, of course, so the period of acquisition will vary, but I can say that, without exception, all of them gained competent speaking and listening skills within a year or two (at most). So, although I don’t know the details of your situation, I suspect it’s really just a matter of time and patience. Meanwhile, you could help fuel the process by increasing his exposure to Arabic even more through monolingual situations and settings. For example, when my kids were smaller, I paid a college student—an exchange student from the United States—to come to our house weekly to play with my kids in English. Perhaps you could do something similar with an Arabic-speaking student. (And if the student speaks English, too, try to conceal that fact from your son or he won’t really have a genuine need to use Arabic!) Best of luck to you both! I have a friend who has used a puppet really effectively with his five year old son. His son knows the father speaks Japanese very well so he replies to him in Japanese most of the time just as you mentioned above. So my friend made a puppet out of an old sock, named it Johnny and uses it often when he plays with his son. Johnny doesn’t speak Japanese and can never remember the Japanese words the boy tries to teach him. So although the father is speaking for the puppet, the son always speaks English when the puppet is out. I thought it was a really good idea and a good tool for those whose kids already know they speak the majority language. Selina, thank you for sharing this really creative idea. I think it’s a wonderful way to help address this problem of a lack of need and exposure. Though its effectiveness would naturally depend on the particular parent and child, it could have an important impact in combination with other efforts. Thanks again (to your friend, too!) for this great suggestion! I have 6 children aged from 36 years to 24 years. I am happy to say that they are all totally bilingual. One of the main reasons is that my Japanese is rubbish, however not quite as awful as they think. I have a few friends who thought it was rude to speak English to their children in front of Japanese family and friends. I never had that problem. As soon as they could read a little Japanese I asked them to translate school papers etc. and the older ones always helped with the younger ones school information. Sometimes they rebelled but mostly it made them feel valued and it worked. As adults they are still amazed at the things I could do without speaking Japanese! Wendy, thank you for your comment. It’s great that things worked out so well for your family—good for you. May we all find similar success on our own bilingual journeys! I loved this! All of us need encouragement and direction as it is no easy task. I’m a firm believer in books, each month I have a budget alone for books for my son, and even though he can’t read yet I read to him everyday. Thank you for your insights, will be sharing this with my siblings. Denhi, yes, books and reading are at the very heart of this challenge, I think. Having a monthly budget for books is ideal because it immediately prioritizes their importance as it adds to your home library on a regular basis. Need and exposure – absolutely! I remember how both our children went through a period of trying to speak Finnish to their French dad, especially in the evenings when he picked them up from the daycare. They were tired and had spent the day speaking Finnish – which they knew their dad also understood. I’m so grateful that he persisted even when it was difficult and looked for ways to increase the “fun exposure.” Trips to the minority language country and cultivating close ties to monolingual French grandparents have been the best way for our family to make sure there is a real need to use that language. Expat networks in your city are also a good place to look for recently arrived expat families who speak the minority language. Don’t give up. Keep talking. Comprehension of language, whether native or foreign, comes before the production of that language. My sister as a child went through a period of time during which she refused to speak Latvian. My parents continued speaking to her in their native language, she answered in English, and then one day she started answering in Latvian. Today her grown children also speak Latvian. I have read this last week because this is completely what is happening between me and my 2-year-old boy! I hope we could get back on track again! It is so hard not to respond right away to his father talking to me in the majority language! I really cannot imagine how did you do that in years! Any tips to not irritate the father who needs to come closer to me or me to him just to whisper a non-secret and non-big deal reply! Just so curious how did you manage that! Please help the non-creative mind Raira! Please!!! Well, I seriously talked to my husband regarding this! What we have agreed is I must answer in English first before I translate to the majority language. But still it is so hard sometimes especially for a non-native English speaker like me! I’m sometimes stuck on English and feel it is easier to express in the other language! Or the topic needs an urgent reply. Or sometimes I am so excited to talk about a good thing that happened, so I cannot slow down thinking how to express that in English, though I can talk about it fast in the minority language. It is so hard for me! Through that, I can’t make it a habit of me answering in English first! Whew! Do you have something there for me to try to help me get back my baby responding in English! Raira, are you Japanese? If so, I suggest that you reach out to other non-native speakers of English who have a similar bilingual goal for their children. The best place to start is with the membership of the JALT Bilingualism SIG (JALT stands for Japan Association for Language Teaching and SIG stands for Special Interest Group). If you can connect with other Japanese parents who are familiar with your experience, I think they’ll be able to offer you useful advice. If you’re not Japanese, my suggestion remains the same: Seek out other parents in a similar position. From my perspective, I’m not sure you’ll be able, all by yourself, to create sufficient “need” and “exposure” so that your son will actively use English. Chances are, as he becomes more communicative, he will mainly use the majority language to communicate with you and your husband. After all, since he’s becoming aware that you both speak the majority language, it won’t really be necessary for him to communicate with you in English. And so, unless you can find effective ways to increase this “need” and “exposure” (like putting him into an international school setting when he gets a bit older), his English ability will grow more passive. I understand your heartfelt goal of “simultaneous bilingualism,” but establishing a passive foundation for later “successive bilingualism” is another viable alternative—and it may be more realistic given your circumstances. I hope this is helpful, Raira! Definitely don’t give up, but do be realistic about matching your aim to your situation. It sounds to me like you’re becoming a bit stressed out trying to maintain an English-only environment when it might be healthier, and still helpful, to use a balance of the two languages, such as using English when you’re alone with your son, but using the majority language when you’re with your husband and with others. Thanks Adam! I told myself already to relax and I just want some other to remind it to me again! Hahaha! Thank you for implying me to relax Adam! More Power! I have a very talkative 5 years old daughter and I have exactly the same problem as you described! I am Thai and my husband is German. We live in Germany. My German is very limited and my husband and I communicate to each other in English. When I have a chance to read bedtime story for her (I work fulltime and often come home later than my husband), I read only in Thai and speak only Thai to her from birth. However, she replies only in German. It gets worse and worse nowadays. I’m frustrated about this. I sometimes could not understand when she told me stories from kindergarten. Recently, my parents came to visit us. She refused to talk to them because she could not answer them. She often sticked to my husband and followed him every where. When I forced her to speak Thai, she ran away (if possible) to my husband. 1. Your daughter isn’t aware of this yet—she’s only five, of course—but she really wants to be bilingual. She wants to speak Thai with you (and her grandparents), and she will regret it one day if she can’t, but right now German is the more active language for her because, so far, the weight of her language exposure seems to tip heavily toward German. 2. It’s hard on you both, I know, but I would recommend that you (patiently) persist in speaking to her in Thai. When she responds to you in German, and you understand what she says, make a habit of restating the same message in the minority language. Although you can encourage her to use Thai with you, emphasizing that German is not your language (maybe try making it playful, too, like Thai is the “secret language” for the two of you? ), I would refrain from pressuring her to use it if this causes either of you stress and interferes with your loving relationship. 3. At the same time, to activate her passive ability in Thai (she seems to understand, but is reluctant to speak it because German has grown dominant), it’s vital to increase the amount of exposure she’s receiving. I suggest looking back at the article above and brainstorming with your husband about each of these areas of input. How can you enhance your daughter’s exposure to Thai each day amid your busy lives in Germany? Be as creative and resourceful as possible in compiling ideas. 4. I would also seriously consider spending time in Thailand with your parents, just you and your daughter. If you can manage a trip there, and stay for a few weeks or so, I think you would find that the intensive exposure could help spark her active communication in Thai. If you could take annual trips there together, that would be especially helpful. Again, I understand your feelings of frustration, but I urge you to keep your eye on the future and seize each day while your daughter is still small. If you and your husband can find ways to be more proactive in supporting her minority language—while making these regular efforts in a light, playful manner—this will have a very positive impact on her language development. You may not see the progress right away, but progress will definitely be made over time. Tam, best of luck! I’m cheering for you guys! Hi Adam, Thank you very much for your suggestion!! After I read your comments, I took it seriously. I immediately booked flight tickets to Thailand. I arranged a kindergarten for my daughter in Thailand. I have to say one whole month in Thailand is really worth it!!! My daughter started to speak Thai after staying there for 1/2 week. I’m really happy about this. We came back to Germany with very positive feelings. It’s not only trigger her to speak Thai, it also makes the relationship between me and my daughter better. She would like to go back to Kindergarten in Thailand again and we will arrange this for her again in the next 6 months. Thank you again for your valuable suggestion!! Tam, thanks so much for following up! I’m thrilled for you and your daughter! What a wonderful breakthrough! Again, this is great news, Tam! Good for you and your daughter! It is exactly what is happening with my two year old son. From his birth I have consequently talked to him in my native language, read books, sung songs and played games, but lately he has started using more and more words of his dominant language. I thought that exposing him to my native language for two weeks in my native country would boost his minority language development, but to my great surprise he started speaking even more in his father’s language. I have tried to give him alternatives when speaking, like would you like an apple or a pear, but even then he answers in his dominant language. My friend also raises a bilingual child, but she forces him to say words in the minority language. I believe it may spoil the experience of learning a language. While others force their children to attend both schools in their dominant language and in the evenings and weekends in the minority one. What do you think? I wouldn’t like my son to develop hatred towards my language because I forced him to speak. Thank you for sharing your experience and thank you for saying that raising a bilingual child is hard work. Sometimes I think that it would be much easier to give up, but then I read such articles as yours’ and get my priorities back on track. Of course, you don’t want to “turn off” your son to his second language—and that’s why it’s so important to keep your efforts as light and playful as possible—but it’s also vital that he receives enough meaningful exposure in the target language. So I would suggest taking a close look at his weekly language exposure and find ways to increase his interactions in your language if the total time falls below a 25-hour benchmark. For more information, see How Many Hours Per Week Is Your Child Exposed to the Minority Language? Because your son is still small, I realize the days can be long and tiring, but I also think a larger perspective would help ease the momentary frustrations and keep your motivation high. In fact, I recently wrote a guest post about this at SpanglishBaby called Your Child Wants to Be Bilingual! Please take a look at that article, too. Best of luck to you, Maria! Despite the difficulties, just keep doing your best, day after day, and I expect you’ll see some significant progress over the next year. At that point, you can reassess the circumstances and then take further action, as needed. For now, though, I would focus on maintaining broad, playful exposure in the minority language, which should include reading aloud to him every day. How old is your son and at what age did he stop speaking the language? Hi, I come from Spain, however I’m living in the UK with my family. I have twins, one boy and one girl aged 4. I moved out to the UK when my children were 2 years old. At that time my girl had started to speak Spanish, however my boy was able to say a few words only. The main goal to move out to the UK was to learn English. It seems they have forgotten to speak in Spanish or even worst they don’t want to speak in Spanish (specially my son). We have been in here for nearly 2 years. Last year they attended a nursery day, and in a few days time they are going to start the school. At home, they talk each other in English and also at home with their parents. Hopefully in a year or maybe in a couple of years time, we’ll be back. To be honest, I’m really worried about the lost of the mother tongue and the vital time in the early years in the learning process. To avoid this situation I have tried many things like talk them always in Spanish, tell them I don’t understand English, watch DVDs in Spanish, repeat in Spanish what they say, reading stories in Spanish, and many other things but nothing seems to work. Do you think I am right? or I have nothing to worry about because they will learn Spanish when we go back? Alberto, thank you for sharing your story—your concern is natural. First, though, let me emphasize the positive: You’ve clearly accomplished your goal of establishing a good foundation in English! Well done! You can then continue to nurture this language after you return to Spain, and your children will benefit for the rest of their lives. As for Spanish, I understand your frustration, but if you definitely plan to return to Spain in a year or two, I don’t think you need to be worried. Your children already have some ability in Spanish (though they may be reluctant to use it at the moment, because their English has become dominant and they know you speak English, too), and that ability will be quickly activated once they return to a Spanish-speaking environment. In fact, after the pendulum swings the other way, and their Spanish becomes the majority language, your challenge will probably be just the opposite: you’ll have to make greater efforts to promote their English! If your wife is Spanish, too, I would suggest, for the time being, that you try to implement a firm version of the “minority language at home” approach: Spanish is used within the home (you and your wife use Spanish with the kids, even if they respond in English), while English is used out in the community. In this way, along with your other Spanish-language efforts, you will continue to foster a solid foundation in Spanish. Best of luck, Alberto! I look forward to hearing what happens with your family! How did you try to mediate this situation when it started? Did your children say why they prefer to use English? First of all I want to thank you for this insightful reading! I have 2 daughters and we live in Italy. Before we had children I always thought I should speak to them in English and my husband in Italian. But now I regret it. Although we have books, movies, journals in English and I continuously speak to them trying to get them to reply to me in English…it is still not happening. I tried to send them to an American nanny once a week but still! And it is very frustrating because they really feel they don’t have to speak nor reply to me in my native language. No one believes they are bilingual and it saddens me a lot. I am doing this for them…and I truly hope one day we can start communicating in English. I have also considered moving out of Italy…but it is not so easy. Barbara, I sympathize with your frustration and I’d like to be helpful, if I can. Could you please offer more details, though? How old are your daughters and what is their English level like now? What exactly are the circumstances of the language use within your family? What is the schooling situation? Approximately how many hours a week are your children exposed to English, and what does that exposure consist of? (See How Many Hours Per Week Is Your Child Exposed to the Minority Language?) Are there any regular situations where they have a real need to use English? (You’re fluent in Italian, is that right?) What sort of English-speaking opportunities are possible in your community? And what exactly is your “regret” about following the OPOL (one person-one language) approach? I mean, what would you have done differently if you were starting over again? The more information you can provide about your circumstances and your efforts to date, the more effectively I can respond with some suggestions. Hello, I’m curious about Barbara’s situation…is she by any chance in or near Rome??? We could help each other out!!! I speak English and my wife and her son of 7 speaks Spanish. My wife speaks fluent English and Spanish and even does interpreting. Her son came to the USA when he was 5 years old. He spoke very poor Spanish and no English. My wife was all for teaching her son English and even chose an English school system over Spanish system at first. After 2 months of being in the USA she chose not to teach him English and only speaks in Spanish to him. A teacher at his school told her that she should not let him lose his culture. Since this point English is not spoken. Since I am his step-dad he has not bonded with me yet so he sees no need to speak English. Now that a year and a half has gone by he is regressing in his English skills. He has learned and only communicates in Spanish. He is refusing to learn English in school and has resulted to mumbling when he is forced to answer a question in English. His mom has influenced him that Spanish good, English bad mentality. He fears he is letting his mom down if he speaks English. It has been a year and a half and he has spoken less than a few words to me in English even though he understands English but can’t form the words to speak it. Is there any hope he will ever be bilingual or will he choose his mother’s language over mine? We do not live in a Spanish community and he is the only Spanish kid in school. It is getting so bad the school is threatening to hold him back. He is in second grade. He resorts to making sounds to communicate with others who don’t speak Spanish. We have been told he will learn it in time but I fear that his fear to disappoint his mother will overpower his learning in school and put him behind. She is fine with him only knowing Spanish even though she is a English-Spanish translator at her job. He is not exposed to English other than school or when I talk to him but he just says la la la to you so he does not have to listen to English. What can I do to help him learn English if his mother is not willing to teach him? When is it too late as each year school passes him by? Jim, I’m really sorry to hear about this situation. I understand your desire to support your stepson, and I feel your frustration, but I can’t really comprehend why your wife wouldn’t care about the level of his English ability, particularly since you live in the United States. I mean, I appreciate her wish to nurture his Spanish side, but if her son is struggling in school, and is unable to communicate with others and with you, shouldn’t this motivate her to take some kind of positive action? Ideally, since she’s bilingual herself, she should serve as a model for him and encourage the development of both languages by using the two strategically. As his English now needs proactive support, English should be emphasized. For example, she could use English with him on school days, and Spanish on the weekends. This sort of clear and separate usage of the two languages should be followed so they aren’t simply used haphazardly each day, which would be far less helpful. At a later stage, after his English catches up, even overtakes, his Spanish, his mother could then modify the strategy and stress Spanish. At that point, perhaps Spanish would be used during the week and English would be used on weekends. The point is, the language usage should match the need, and currently, because his English development is apparently poor, English should be emphasized more strongly. At the same time, I would also have your stepson evaluated by a trained speech-language pathologist in order to rule out a more biological cause for his speech delay. The fact that he was speaking “very poor Spanish” at age 5, when he arrived in the U.S., could be indicative of a problem in this area. Best wishes to you and your family, Jim. I hope your wife will come to recognize that this situation isn’t healthy for her son and is hindering his development, both academically and socially. I’m honestly not sure how much you can do to help without your wife’s proactive involvement. I have a different problem. My brother lives in the U.S. and married a woman from Japan. They moved in with my parents, in the U.S. The child is now 3, and while she understands some English and is highly intelligent, she chooses ONLY to communicate in Japanese, only hangs out with her mother’s friend’s children who speak Japanese, and the mother only hangs out with Japanese speaking people (all coincidentally Japanese women who transplanted to the U.S. and married American, English-speaking men, and they all met in church). I believe that the mother is using foreign language as a weapon, as a means of creating separation between the child and the rest of the family who don’t speak any Japanese. When people try to speak to her in English she completely ignores them and even gives indignant looks as if to say you must be stupid, and I dare say this is a reflection on the mother. I speak a little Japanese and have excellent pronunciation, and therefore am able to tell the child no when she is being naughty. And she listens to me. But I don’t live there. I recently suggested to my family that they ask my brother’s wife for Japanese language lessons so as to find a way to connect them. I would like to know what your opinions are on this. Rachel, I’m sorry to hear about this difficulty. I’m sure it’s frustrating for the whole family. Unfortunately, from your description, it sounds like the worry regarding your niece’s language development is a symptom of deeper issues involving the mother’s adjustment to her new life in the United States and her relationship with your brother. I mean, how does your brother communicate with her and with his daughter? And have the parents discussed and agreed on a “language policy” for their family so that their daughter can develop and use both languages actively? So I would strongly advise that your brother, and your family, make every effort to help his wife adjust. Try to understand, with as much compassion as possible, how hard this adjustment probably is for her. The more proactively, and positively, this situation is addressed now, the more likely she will endure this shock to her spirit and settle into her new life there. The worst-case scenario is not something you want to face, with regrets over missed opportunities. I wish all of you the best, Rachel. I hope 2014 is a good year for your family. A 3-year-old should be entering preschool/pre-kindergarten anytime now, shouldn’t she? If it’s an English-speaking kindergarten, she will start speaking English very fast and will get used to using it with other people. From the child’s perspective it maybe seems useful to ignore “English”, because that reduces the number of adults who can give her orders. It might not even be a conscious decision. If they moved recently, she might also need some more time to get used to the new language and environment as well. I still haven’t hit the actual problem since I’m currently still pregnant but the language topic has already come up with my husband. He is Japanese and doesn’t speak any English (well, maybe 10 words or so), I’m actually from a Northern European county but have a very good English level. Together we speak Japanese but I haven’t formally studied it at all, just bits and pieces, a little bit of teaching from a friend who studies it in uni, and then simple communication with my husband, his family and people where we live (countryside, so no one knows any English). At first my Japanese was very very limited, so it was a miracle we made it past the dating stage but now I can pretty much manage in simple everyday conversation, however specific terms (medical, economical, etc.) are still beyond me and my grammar is iffy, kanji is just at around 600. Not only do I have the difficult decision to make of whether to comply with my husband’s tentative wishes that I speak English to the future kid (as opposed to my mother tongue) and keep my mother tongue to the future if even that (which would mean my side of the family would have to speak to my child in English…which they would take hard since I am from a small country very defensive about it’s language), but whichever language I choose my husband will not be able to speak the minority (=mine) language at home to the kid, it shall be only on me and I totally see the troubles starting after the child goes to (Japanese) kindergarten and school. Sadly, I would say the option of my husband starting to study English is pretty much out since he is the usual Hardworking Japanese who just does not have the time after work. So, though the problem is yet pretty much hypothetical, it is already quite a lot on my mind. First, let me commend you on thinking through this situation now, before the baby arrives. Your early choices are obviously very important, as they will set in motion the shape of the whole journey to come. And if you want your child to acquire your mother tongue, fostering this language right from the start would give you the best chance of realizing this aim. It’s possible, too, that after a foundation is established in the mother tongue, you could then gradually bring in English as well. The key, though, would be to establish that foundation before Japanese schooling begins and the heavy influence of the majority language is then felt. If you would feel comfortable using English—and accepting the fact that your child might never learn your mother tongue—then there could be advantages to this choice. English is now a global lingua franca, ability in the language is a huge plus in Japan, and, as you’ve mentioned, this is your husband’s preference. At the same time, since your side of the family would still be able to communicate with the child, they may be disappointed about the lack of ability in your native language, but I imagine they would come to see the merits of this decision. Whether you first focus on your mother tongue or on English, providing sufficient exposure in the minority language will be an ongoing challenge—though this probably would be easier in English, considering the wide availability of English-related resources and opportunities. The third option would be to use only Japanese. This would naturally be the “easiest” option for your home, but it would be a huge disappointment to your side of the family and I suspect you would come to regret the “missed opportunity” of raising a bilingual child. I hope these initial thoughts are helpful and I look forward to hearing from you again as time passes—or whenever you might need some support. I’m cheering for you from here in Hiroshima! I definitely think option 1 or 2 is the way to go, since the Japanese side of the family is really cheering for either bilingual or at least pretty good English-speaking child. No one can know what the child wants to do in the future, to stay in Japan, go to Estonia (my country) or Europe or US or whatever. Either way English is really important in keeping the child’s future open without the parents killing off some paths right from the start by only speaking Japanese. I have read that in the cases of many languages in a family the parents should opt for their mother tongue as opposed to a learned third language (English in my case), since no matter how good your language ability, you can only teach all the nuances and whatnot of your mother tongue. It makes sense but of course if that language is a minority language, it might not be so important since it shall be a struggle to get the child to learn all that you have to offer anyway. Thank you! I’ll try to keep you posted over the years. I guess it might be helpful to others too, since this is not so common a problem. Most of my multinationality-couple friends have English as the only or main language they communicate in. No one I know has been as nuts as me to start a relationship in a language I barely speak with someone who only knows one language. As useful as English is nowadays, a child can learn three languages quite easily. If it’s important to you (and your family) to communicate in your native language with your child, you should discuss that with your husband some more. The child will pick up his native language from him and his family either way. And you never know how your language might come in handy later in the child’s life either. Currently Japanese parents are putting more and more value on a better English language education, which their educational system hasn’t been able to provide them with yet. That’s why there are more and more bilingual kindergartens in Japan, which could be an option, if you and your husband want your child to have a very good command of English. I know people in Northern Europe speak excellent English. When do you start studying usually? Nanna, thank you for adding this helpful comment. It’s true, if a bilingual kindergarten is available in her area, then this would be a potential way of including English exposure in addition to the mother tongue…though it sounds like she lives in a rural part of Japan (“countryside, so no one knows any English”). Thank you, Nanna, for the comment! Yes, in my country (Estonia, tiny tiny country) children nowadays start studying English really early…like 3rd grade or so. I did too but at that time it was at first the parents initiative and we had a private teacher who came to school, the official program started at the 5th grade, I think. In Estonia knowing English (and other languages) is a must, you cannot get a good job otherwise, since the country is tiny most of the commerce, service, etc. always has the English option too. Bilingual kindergarten is sadly out since I live in a small town (integrated into a bigger one but still, mostly separate) of 3000 people in the middle of mountains an hour from Matsuyama. Perhaps the best option of getting English more into the community actually is my own contribution. This has been as of yet simply a thought of the neighbourhood but we were talking of me maybe teaching local children some basic English. Not only would it become a job for me (good thing for a housewife of barely a year) but it might also make the aforementioned trouble of English-speaking kids having a hard time at school since others do not know English. If we could get neighbourhood children some years older than my child and at some point maybe also children of the same age to attend, it should (should, who knows if it happens) create a “English is cool” attitude. I guess this is the good side of living in a small place—one person could actually make a change. Of course this teaching thing is simply an idea right now but now that I think about it—if it would also make it easier for my own child to become bilingual—it becomes even more important than just finding something to do here to get the community more immersed in English. Adam, you’re absolutely right. If a child can get enough exposure to a language, it can reach a native level even if it starts studying later, like in elementary school. The older you get, the more exposure you need, I guess. Kids who enter an international school become fluent in English pretty fast. If that’s not an option, it’s better to start earlier. But at the same time, you don’t necessarily have to abandon your native language in favor of English. I’ve seen little private English classrooms in the most rural areas of Japan and I guess most of them were established basically by the only foreigner living there. There might be one near you? If not, it sounds like a great idea to make this your job. 😉 You could also ask the local kindergarten if they’d be interested in an English teacher / establishing an English class for those kids whose parents are interested. Hi! Very interesting article! I want to share my story! I was born in Australia to an Australian father and a Japanese mother. When I was three years old, my family and I went to live in Japan for six years and although English was my first language (L1) upon arrival, soon after, Japanese became my mother tongue and English was disregarded. When I reflect back and watch family videos of our first few weeks in Japan, it was interesting to see that I only spoke English with my parents and that was my identity as a child. I understand that children easily adapt to their environment, and although there were opportunities to learn English in Japan especially considering my father had a language school, I resisted and continued to assimilate Japanese culture and strove to have only one identity. In addition, at that time in the early 1990s, English language learning was not introduced at the elementary level and there was strong emphasis to develop Japanese language abilities amongst elementary school students. My special encounter with English was in 1995 when my parents decided to move back to Australia to start a new life. The decision to move back was made not only for sociocultural benefits but also for the fact that English would be acquired like a native for both my brother and myself. This was the beginning of my language appropriation, claiming the ownership of English and the development of my new identity. Just to add to the above post, I’m back in Japan as an adult! I got married in 2013 to a Japanese man and we had our son in December. Now it’s my turn to raise my son as a bilingual child. Before coming to Japan, I gained a degree in MA in TESOL. I hope to share my know-how and teach English in Japan! Hana, thanks so much for sharing your story. Like me, I’m sure many readers of this blog will find it interesting food for thought. And I’m glad that, in the end, you were able to acquire both languages successfully! Hi! I just discovered this website and you have great tips, thank you! I’m pregnant and my labor is due mid August. This means that I and my husband started to think about this language issue more than before. I am Turkish and he is German. We are living in Austria. He speaks basic Turkish and my German is a bit better, but still cannot hold a normal conversation. We were thinking that after the baby is born, we will speak with her in our mother tongues, and between us a mixture of Turkish and German. (I definitely need to improve my German to find a job in Austria). After I read this post, I got a bit worried because if the kid notices that I can speak German, what if she rejects Turkish? Would you then suggest that we continue to speak in English between us? About your question, I do think you would raise the odds of successfully nurturing your child’s active ability in Turkish if you avoid, to whatever extent is realistic, the use of German in his/her presence. The more you openly use German, the more you could potentially undermine the child’s need to communicate with you in Turkish. I also understand your personal need to improve your German, but I would suggest, at least through the first few formative years of your child’s life—until a firm and active foundation in Turkish is established—that you try to work on your German more “secretly.” This means, yes, it might serve your situation best if you and your husband continue to communicate with each other in English, while consistently using your mother tongues with the baby. Hi Adam! Just stumbled upon your site. I’m American and I’m moving to Japan this Fall with my wife (Japanese) and our 2 year old daughter. We currently live in a major city so my wife has lots of Japanese friends with children most of whom are married to non-Japanese. One thing we have both noticed is that out of a group of about 10 children with Japanese mothers, our daughter is the only one who speaks only Japanese even though we religiously follow the technique where I always speak to her in English and my wife always speaks to her in Japanese. She clearly understands English but 90% of what she says is in Japanese. This is in contrast to her friends who are the exact opposite (understand Japanese but speak almost entirely in English). We were a bit perplexed about this since these children’s parents all seem to be following very similar parenting techniques to us when it comes to language but I was at a BBQ last weekend and I overheard two of the children’s fathers laughing about how sometimes their child says something in Japanese to them and they have no idea what they’re saying. Ah ha! That’s the difference! I’m no master of Japanese, but I have no problem understanding my daughter when she speaks to me in Japanese though I always respond in English (after usually repeating whatever she said to me in English). I realize now I need to get better educated on how to successfully raise a bilingual child especially given the impending move. We are planning to switch to 100% English in the house once we move (my wife is very fluent in English) but I’m sure it will still be a challenge. Hoping to learn a lot from your site! Yes, it sounds like a lack of need to use English is at the root of the current difficulty. It may be, too, that through her first two years, she’s received more language exposure in Japanese than in English. I think it’s wise, once you’re in Japan, that you’ll be using English as the home language—it’s very tough providing sufficient exposure in the minority language when it comes from only one parent, and that parent isn’t the main caregiver. (I’m speaking from experience, I’m afraid! ) At the same time, you’ll need to be sensitive about your daughter’s feelings when you wife begins using more English with her. I expect this new arrangement will come to have a very positive effect, though, on your longer-term journey. Such an amazing post… I am over frustrated and feeling depressed about my situation. I was born in Venezuela so I speak Spanish. My parents are Arabic but I never really learned Arabic well, just understood some. I got married and lived in South Africa for few years and when I had my son I only spoke Spanish. We moved to Israel and I had to learn Arabic myself and drag my kids along with me. At the beginning I spoke Spanish but then I completely stopped. I feel as a failure for many reasons specifically because my sisters won’t speak Arabic and when they want to speak with my kids they can’t understand each other and when I try to teach my own kids a life lesson I find it hard to explain myself in Arabic. They are 4 and 6. Is there anything I can do at this stage? Or I just made my kids lost a language? Loris, I feel for your frustration. I’d like to be helpful, if I can, but I’m afraid I don’t have enough detail about your situation to offer concrete advice. Could you please respond to these questions? With a clearer understanding of your circumstances, I can then share my thoughts. *When exactly did you move to Israel? *Is your majority language there Arabic? Is your minority language (your target language) Spanish? *You’re speaking only Arabic to your children now? Is that correct? *How long did you speak Spanish to them? And why did you stop? *What language does your husband speak to the children? *Your parents speak Arabic, but your sisters don’t, they only speak Spanish—is that right? Do your parents and sisters live in your area? *Are you children attending school in Arabic? *Are you working? How much time are you with the children? *What Spanish resources do you have in your home? What opportunities for exposure to Spanish do your children have in your area? Hello Adam and thank you so much for your quick reply and your means to help me. I moved to Israel 4 years ago (sadly). In this town the majority language is Arabic and they will learn Hebrew at school for second grade. My target language is Spanish (minority since I am the only one who speaks it). Only speaking Arabic right now but might speak some commands in Spanish like go and brush your teeth or time for a shower, very few words. I spoke Spanish to them until they were about 2 and I stopped out of embarrassment for being the only one speaking Spanish and the feeling that if I was going to learn Arabic I need to talk it and since I don’t have many friends I just felt I needed to practice it with them. My husband speaks Arabic and sometimes English to my oldest…he understands and speaks some English. Their school is Arabic speaking. I don’t work so I spend a lot of time with them. I don’t have many resources, just a few books in Spanish, one for teaching to read and a story book. My parents speak Arabic and I feel I am doing as my mom did to us, she didn’t speak much Arabic to us. They live in Venezuela. Loris, thank you. I now have a better understanding of the situation. If the first three options I describe there aren’t possible for you, your only option is the fourth approach: a major “intervention.” In other words, you will have to make Spanish a much higher priority in your family’s lifestyle by increasing the children’s language exposure through interactions with you and through a richer environment of resources. It’s true, your children don’t really have a need to use Spanish with you—since you generally communicate with one another in Arabic—but this shouldn’t stop you from speaking Spanish to them. I suggest, though, that you clearly define the times you will use Spanish, and ease into this change in your lifestyle, in the following way: 1) Speak Spanish to your children on the weekends while continuing to use Arabic on weekdays; and 2) Read to your children in Spanish every day (and I do mean every day, on weekdays and weekends). Although your children will respond to you in Arabic, that’s fine for now: the most important thing is increasing their exposure to Spanish so they can develop “passive ability” (understanding but not yet speaking). Even passive ability would be a major accomplishment because this ability could then be “activated” at a later time. So passive ability is your first aim, and this can be achieved by speaking Spanish to them and building up your home library of children’s books and other resources (magazines, music, DVDs, games, etc.). Without resources in Spanish, it will be difficult to realize this goal. Loris, I hope these thoughts are helpful. If handing down your mother tongue to your children is truly important to you, then it’s surely possible, but you will need to put this goal at the very center of your life and be highly proactive, day after day after day. You can do it, Loris! And I’m cheering for you! Thanks a lot Adam, you are so nice and helpful. What worries me is that they don’t understand everything I say in Spanish so what do you think is best? Should I say it in Spanish and translate for them? They get frustrated too if they don’t understand. Loris, I know it will be a bit hard on your children, at first, but during “Spanish time,” I strongly advise that you use only Spanish. If you get into a habit of translating for them, you will be undermining your own efforts. Your aim is for them to understand Spanish, not Spanish translated into Arabic. So use simple language, facial expressions, gestures, drawing—whatever you have to do to communicate your message—but stick to Spanish. If you do, and you do this as playfully as you can, like it’s a fun game for the family (give them prizes for their participation! ), then gradually your children will come to understand your Spanish and their passive knowledge of the language will grow. I’ve done a little reading around your site and am wondering if you could offer me some insight. I am Mexican-American, speak English and Spanish fluently and picked up French later, with which I’m actually terribly out of practice. I have worked in a kinder immersion program, and currently work for an organization that helps schools implement language immersion programs, but these programs are for school age children not infants, which is where I am having lots of questions! I have a 6 month old daughter, with whom I have been struggling to figure out what I should do and what I can accomplish linguistically. Her dad is American and while he does not speak Spanish or any other languages, we both want her to become bilingual (ideally, I would be able to teach her French, too, but honestly don’t know how that would even happen.) Logically, I know that children need to be exposed to a language in a consistent manner in order to absorb it, but I worry about how I can accomplish that in my particular home setup. Since she was born, I have been trying to speak to her in Spanish, but because her dad and his family don’t speak a word of it, I revert to English when I’m around him or at family gatherings, in an effort to not to leave anyone out. This makes it difficult for me because even though I am fluent in Spanish and in English, once I have been speaking English (which I have to do for work, with his family, etc. ), going back to Spanish takes me some time to “warm up”, if you will. Speaking in English sometimes, is so much “faster”. I’ve read a little bit about OPOL, and originally, this is what we were trying, but I worry that it won’t be feasible or effective because I will still need to communicate with my husband in English, our only common language, and inevitably, the baby will overhear or directly witness it, which will affect how she feels about needing to speak a different language with me. I do try to supplement with songs, stories, and books in Spanish, and whenever my mom cares for her and she is around that side of the family, she is surrounded by Spanish. I feel terrible because I feel like I am not doing enough, but I desperately want my daughter to grow up actively working on developing her linguistic abilities. What am I doing wrong? What can I change? What can I do more of? Is our predicament with OPOL (speaking English to one another) not that big of an issue? How can I ensure that she becomes bilingual, at the very least, when one of her parents is monolingual? Does this rest firmly on my shoulders, and should I just be more consistent about staying in the language with her? There are a number of Spanish/Mandarin immersion programs in our area, and so I’m hopeful that regardless, she will have that opportunity when she reaches school age, but I just want to do as much as I can to prepare her brain for that kind of education. Thanks in advance for your advice. Aida, your circumstances are challenging, and I understand your concern, but it sounds to me like you’re making the right efforts within the parameters of your lifestyle. As long as you’re doing your best to use Spanish with your daughter as much as you realistically can, while consciously trying to limit her exposure to your spoken English, to whatever degree is practical, I expect that her Spanish side will grow very naturally over time. And by combining a Spanish immersion program, when she gets a bit older, with your continuous efforts, you’ll surely experience good success at fostering your daughter’s active ability in the language. And the thing is, when you adopt that attitude, I don’t think you can really fail. Aida, I wish you the very best on your bilingual journey. (And once Spanish has a firm foundation, you can make it a trilingual journey with French!) I look forward to hearing good news from you as time goes by. This is the best and most detailed article and site on the issue of raising bilingual children (and the issue of English speakers as a minority) that I have come across on the web. I have been reading up on this as my son was born in Morocco last year so I am reading up on how to raise a bilingual child. Your points in this article are common-sensical actually, as I have realised. I speak fluent Arabic, classical (90%) and Moroccan (50%) but I want my son to get English from me. Though, as you have superbly pointed out in the article, he may clock on that “hold on, my dad speaks fluent Arabic anyway, so what’s the point of this English stuff!” The only thing is that in Morocco, English is now taught in primary schools, though not much, and in any case I still want to instil an intense English immersion regime from now. I think in my case there will be an issue in terms of interaction with other English speaking children. However, I will try in these early years to instil a programme along the lines and weekly hours which you have outlined. 1. Do you have a book on this topic? I have not checked out your site fully, so you may well have published books on the topic, this is the first article I have read on your site. If you do not have a published book, I suggest you publish this along with a kind of home-schooling immersion plan for those English first language speakers who are in non-English majority countries. 2. At what ages should toddlers be read to? 1 year of age, 2 years old, 18 months? Thanks for your work, and I will now be an avid reader of the articles on your site in this regard! At this point, I’ve created one eBook, a unique resource titled Instant Inspiration for Parents Raising Bilingual Kids, and I’m now working on several others. Thanks for your ideas and your interest. As for reading aloud to children, I believe this powerful routine should begin right from birth and then continue, day after day, throughout childhood. Reading aloud, in fact, has long been the bedrock of my efforts, with both my students and my kids. For much more on the subject, see The Secret to Raising a Bilingual Child and Recommended Resources: Good Books on Reading Aloud. You’ll also find this useful thread on reading aloud at The Bilingual Zoo. I have a question. I live in Taiwan and my two kids, aged 3 and 5, speak both Chinese and English. However, I noticed that the little one speaks with an accent and in general his English is not as good as his brother’s. Putting aside their age difference, I was wondering if it’s usually the case in bilingual families that the older kid speaks better minority language as he’s been more exposed to it before their sibling arrived. When playing, my kids use mainly Chinese but when I’m involved in their games, they use English. I never speak Chinese with either of them so I’m just trying to find out if it’s a pattern with other families, too. Tom, thanks for your question. Yes, it’s often the case that the second sibling’s ability in the minority language is a bit weaker (at least early on) because the child’s exposure to the minority language tends to be somewhat “diluted” in comparison to the first-born child, who was the sole focus of attention for a while, and because the siblings may be using the majority language more in their own communication. To remedy this, I would encourage you to provide as much exposure in English as you can—particularly during these early years—and try to give your younger son more individual time, too. Through your proactive efforts (definitely read to them every day! ), I expect both boys will benefit and their English will grow stronger and more natural over time. Hello Adam and thanks for your prompt reply. In fact, I’m trying to raise my kids as multilingual as grandmother speaks Polish, too. But it’s an overwhelming effort and a big burden on the kids, I’ve noticed. The only solution as of now is bringing them to Poland where they’d be exposed to the Polish language on a daily basis and thus learn it. I tried to devote weekends to learning the third language but it’s increasingly difficult for me and the kids alike to stick to the plan. Tom, yes, it sounds like seeking to nurture Polish—at least at the moment—could undercut your efforts to promote their English. I don’t know all the details, but perhaps Polish could wait until they’re a bit older. Then, if you pick it up again, and spend time in Poland, there’s no reason why they couldn’t develop some ability in Polish, too. I have a rather different situation I am rather stuck on. I would appreciate any advice as I see you have helped many. I should start with a little background before I address my dilemma. My parents immigrated to the States from Slovakia when I was 3. My older siblings and I were brought up to speak Slovak at home and as we grew up we spoke to our parents in Slovak and to each other in English. This was normal for us. As we grew older our Slovak vocab stopped developing and we just started to fill the missing words with English when speaking with our parents (as you mentioned in your article, the need for me to speak my minority language was just not there). At times there was frustration from both sides as my parents level of English was about the same as our Slovak. This was never really an issue between us but I noticed when I reached adulthood that I could never really sit down and debate something with them or clearly communicate some things properly, I’m sure this communication breakdown also frustrated them at times. Now, my dilemma is basically my sister and her husband (I still speak English with my sister and a mixture of Slovak and English with her husband) have a son and speak to him in Slovak which I fully encourage. The thing that gets me is they prefer I speak to him in Slovak all the time. He clearly prefers to speak to me in English and it’s awkward when I visit and we’re all in the same room I have to switch languages to speak to my nephew. It makes me feel uncomfortable and I feel it’s just confusing the poor kid. I know my sister tells him when I’m not there that he should speak Slovak with me. Sometimes when she catches us speaking English with each other and she will tell my nephew (not me) to switch to Slovak. My nephew is a smart 7 year old, he’s got a good grasp of both languages, I don’t know why my sister is scared to let him speak English with me. I’m hardly going to undo all their hard work. I respect the fact that I am in her home, but I don’t feel comfortable with them trying to control which language I use to communicate with my nephew when clearly English works for us both. At the moment I speak to him like I did with my parents, basically half & half with all the frustrations I felt with it. I would like to address this delicate issue gently with my sister and her husband but I’m not sure how. I should add, my nephew and his teenage cousin freely speak English together when he visits even though he himself speaks basic Slovak. Go figure. Eva, I appreciate your feelings. I’m not sure how frequently you see your nephew, but even if it’s fairly often, I don’t think you would “undo all their hard work” by using English with him. That said, it’s also true that your interactions have an impact, one way or the other, on his bilingual development: your use of Slovak supports his progress in the minority language while your use of English undercuts this aim, even if only to a modest degree. I don’t think there’s “neutral ground” here. And because nurturing a minority language in the United States can be very difficult (as your family knows), and your sister and her husband are clearly determined to succeed as best they can, I honestly think you would be serving this goal that they care deeply about, and your nephew’s longer-term future, by respecting and supporting their wishes. It may feel “uncomfortable” at first, but if you take this on positively and proactively—even talking to your nephew about it to re-establish your relationship in Slovak—then it will get easier for you both and you’ll be making an important contribution to promoting his minority language and keeping Slovak alive in your family tree. First of all thank you for creating this website Adam! I never thought that I could find someone to answer my questions about being bilingual so thank you! I’m Taiwanese and so are both my parents. I speak Chinese with my peers, teachers and anyone else outside my family. My parents believe that English is important so they’ve been speaking to me in English ever since I was a kid. Personally I prefer English over Chinese, (Ex I think to myself in English more often than Chinese) but I’m still fluent in Chinese. I never thought that this was a problem until recently. As I’m maturing to an adult my English ability has increased rapidly, and my parents can’t keep up. I try communicating with them in Chinese sometimes but it feels plain weird (the thought’s implanted already…) and sometimes it’s hard to explain tiny details since there are differences between every language. Recently I’ve become skeptical of my parents choice of my upbringing. I mean, sure I’ve gained a lot of opportunities because of my English ability and I really love the language, but is it really necessary to learn English as my mother tongue rather than my native language? I’m a patriot and yet the reaction I get from most people is that I’m a “half-foreigner” who does not care for my own culture. Sometimes that stings. Lily, thank you for sharing your perspective. I feel for your frustrations, and I encourage you to stay strong and allow time to help work out these difficulties. I’m assuming you’re now in high school, a time of life that has its share of challenges, no matter the number of languages. Finally, you’re welcome to join us at The Bilingual Zoo. Although this friendly forum is geared mostly for parents and teachers of bilingual kids, some members are also young bilinguals like yourself. In any event, you would find this site a safe space to share your thoughts and feelings and receive warm support from people around the world. Take good care, Lily! I look forward to hearing good news from you as time goes by! I just stumbled across this website and wish I had seen it earlier. I am a Pre-K teacher and am having difficulty with one of my children learning English. He arrived 12 weeks ago from Puerto Rico, not speaking a word of English. His family only speaks Spanish at home. He has picked up quite the English vocabulary in listening and understands the majority of what I say. However, he does not want to speak English. I know he has no English support at home. He is extremely smart and capable of speaking it, he just doesn’t want to. Do you have any suggestions? He’s beginning to suffer in class and I want him to succeed! As a teacher at Hiroshima International School, I worked with many children who went through this sort of “silent period” when they first entered the school and all of them, without exception, eventually began using the language actively. So I would advise patience while creating ways to gently encourage his “need” for the language, such as pairing him to interact with a friendly boy in your class. I expect that, with your warm understanding and support, this situation will work itself out just fine on its own timetable. I am a mother of two boys (19 months and 2 1/2 years old) and we live in the U.S. but I was born and raised in Germany. My mother is from Spain and my father from Italy and I speak all three languages fluent (well + English now). I came to the states after I got married to an Italian that came here when he was 16 years old. When my first one was born I was starting to talk mainly Italian to him but since he started to talk it is mainly in English. He does say words here and there in Italian, but his conversations are in English. My husband and I mix from Italian and English back and forth between us. I make an effort on talking Italian to my son and he answers me in English! My in-laws live close by and speak broken English but when my little one talks to them they answer back in English instead of Italian. I’m so frustrated and don’t know what to do. I know out of my own experience that I spoke and answer in German at first but I understood my relatives and started speaking the other languages when I was 7-8 years old. The difference is that my father insisted he didn’t understand me so I was forced to speak to him in Italian but my husband doesn’t do that with my sons and neither do I. I really wish I could teach them everything I know because I have family all over the place. I just don’t know how!! I do stress more over the Italian because of my husband’s background. Any advice you could give us? Thanks! Once your efforts to nurture Italian are on a better footing, and a firm foundation in this language has been established, you can then consider bringing in German, too. But for the moment, I recommend that you first focus your proactive attention on Italian. Best wishes to you all, Giulia! Hi, I’m from Brazil, I have been living in the U.S for 7 years now, I’m married to an American and we have a 3 year old son. I was a stay-home mom until my son was almost 2 and went to Brazil twice and always spoke Portuguese to him so he can talk to my family that still lives in Brazil. He is exposed to English as we live here, he goes to daycare all day and his dad speaks in English but I still talk to him only in Portuguese. He understands everything I say to him but replies in English. I get frustrated and my parents keep pressuring me, saying that he is not speaking any Portuguese anymore, but I try how I can. I work full-time and talk to him only in Portuguese when home, but we don’t watch a whole lot of Brazilian programs. I have a lot of books in Portuguese and read to him every night, and we listen to Brazilian music in the car a lot of times, but mostly he is only exposed to American world. I just love this website. I just read it and I keep reading your articles. Thank you so muc, I hope I can find some creative ideas here in how to make him keep going with Portuguese language and hope he speaks more Portuguese. I don’t want to give up, this is our native language and nobody in my family speaks English so this is really important to me. In addition, you can find further support, from parents all over the world, at The Bilingual Zoo, a warm, lively community for “keepers” of bilingual kids. Keep going, Guta, day by day! Your best efforts will surely pay off over time! I love your site already. I will keep it up, thank you. I have a 5 years old boy who studies in an English medium school in India. I and my husband speak to him in English (our second language) from his birth to now and husband and I speak to each other in English too. Our son can communicate in English but when compared to a child who is exposed to the majority language Hindi here, he’s far behind in talking. He still doesn’t know or doesn’t want to tell what he did in the school etc. Reluctant to answer questions. Most of his peers at school can communicate in English and English is their second language too. However so far I don’t see a fast improvement of his English speaking and understanding. All our other friends and relatives etc speak in majority language Hindi but we rarely meet them. So my son has only me and husband to help him to communicate in either language. Now I want my son to learn majority language Hindi too. 1) I speak to him in Hindi while my husband continues to speak to him in English and husband and I speak to each other in Hindi. 2) We both speak to him and each other in Hindi at home. Let him learn English at the school. However his teacher is asking us to speak to him in English at home by saying he won’t understand some instruction in English. My other doubt is will my child be able to continue education in English medium with this situation specially if we stick to Hindi only at home. Thank you for listening. I really appreciate any advice from you on this matter. Sorry I couldn’t mention… I’m stay at home mom and my husband has few hours left to spend time with the son. I really appreciate your site and did a little reading around and got to know a child should be exposed at least 25 hrs per week to the minority language. At the moment my son spends only three hours in his English medium preschool. So my understanding is he should be exposed another 2 hours further to English at home and rest of the time I can speak to him in Hindi in a day. Please make me correct if I’m wrong. Prisha, it’s naturally difficult for me to judge your son’s level of English ability at this point, and how much lower it really is compared to his peers. I also don’t know how long he has attended this school. If he entered the school not long ago, then it’s only natural that he might be feeling a little shy or intimidated, and I advise understanding and patience. As I assume your son is able to communicate well enough with you and your husband, then, unless there is another type of difficulty not yet determined (like a disability of some kind), I expect his proficiency in English will develop at a satisfactory pace as time goes by. Prisha, I send best wishes to you and your family! Hi, great article. My son is 3 and we tried to raise him bilingual from the day he was born. We live in New Zealand and I’m Turkish so I speak Turkish only to him. He was so good until 2. He could tell you all the colours and things around him in Turkish, but recently last few months he stopped speaking Turkish. He still understands 90% of what I say but he responds in English. I still speak Turkish mostly but started to speak some English if he doesn’t understand or he’s upset etc. What do you suggest? We don’t have any Turkish speaking family near us or any community here so he can only speak Turkish with me. I sometimes read to him in Turkish and watch Turkish cartoons but he’s still speaking back in English. Do you have suggestions? I really want him to be able to speak Turkish. Umut, it isn’t unusual for a child to begin leaning on the majority language, especially when he’s aware that the minority language parent is also proficient in this language. In such situations, the child no longer feels an organic need to use the minority tongue. At the same time, I suggest you actively reach out to other Turkish speakers to supplement your efforts. Are you sure there are no other Turkish speakers in your area, who might be interested in babysitting your son (playing with him in Turkish, while pretending not to speak English)? Meanwhile, could you take advantage of Skype to connect more regularly with family members in Turkey? Umut, ultimately, your son’s ability in Turkish will largely be proportional to the efforts you make and the conditions you create. I know your circumstances are challenging, but persistence and resourcefulness will pay off over time. My philosophy is just go with the flow. Let them speak the majority language, but still expose them to the minority language and culture. Even if kids are passively bilingual it’s not a bad thing, and plus if they already understand it, it should be easier for them to pick it up and speak it if they do so desire later on. Just not to blame, criticize or scold for not speaking the less important one. It seems parents are in a hurry to get their kids to speak the minority language and be fluent in it. I find that constant demand and insisting they speak the minority language can backfire…saying that because I have seen it, while those who are not forced to speak the language at home, but later (due to positive experiences that fostered the love of the country) have a desire to pick it up and speak it. And believe me, they do manage well. Plus there are so many opportunities to learn languages…I find it silly when people are saying languages will be lost if you don’t start at a young age. I never spoke my parents’ language until I was 17, and that was when I went to India and had an awesome time. Like many parents are saying, I also replied in the majority language when the other language was spoken. I can manage a decent conversation now, I’m not bothered about being fluent because I am connected to India and Indian culture in other ways. Language is not the be all end all ordeal. Seems like many people think it is. You can still maintain good relationships and be connected w/o speaking the minority language. But I do agree we should encourage young kids to speak as many languages, but not insist or force it on them. I certainly agree that passive ability in the minority language is an important achievement, too, and can be made more active in the future, as your experience demonstrates. At the same time, it’s also true that many parents feel a deep desire to communicate with their children in their mother tongue for the life of their relationship. (See Why Communicating in English with My Kids is So Important to Me.) Moreover, without some active ability in the minority language, children will find it difficult to communicate with extended family members who don’t speak the majority language well, particularly grandparents. My own parents, for example, would be very sad, I’m sure, if they weren’t able to communicate in English with my kids. And though it’s always possible to gain greater proficiency in a language at a later age, it’s nevertheless true that starting earlier is an advantage because the brains of small children are naturally tuned to acquiring language at that time. In other words, the earlier you begin, the more your aim is supported by the power of nature itself, which can make the process more efficient, more effective. …the dreams of many parents have been dashed because they realized too late that raising a bilingual child demands a lot more time, energy, and expense than they originally imagined. You do have good points and if parents foster language development the right way, it’ll be fine. Very true too that the earlier the better. As for being “easygoing”…I don’t understand how a parent is “easygoing” if they speak their language to the child and the child responds in the other language. It’s not like the child is not disciplined or behaving badly for not speaking the language. And I don’t agree with forcing, either. I understand developing good relationships, but even with lack of knowledge or fluency in the language it does not mean the relationship will be lost. It definitely is a big boost though, I agree, and may make the kids want to learn the language and it will grow in time. There’s more to a relationship than just language. I’ve seen examples of that, heck I’m so close to my friend’s Vietnamese mother who knows no English (and I’m not even Vietnamese myself), but I do get to know her interesting life story and all, and we cook together LOL. But anyway, I hope I am not attacking you, just giving another perspective, because I have seen many who (not just me) refused to speak anything but the majority language and later made it active. I guess my advice to parents is to find a way to instill that desire to make them active speakers. Make the home country an extremely good experience and fun, like more of a travel abroad or something. One girl never spoke her parents’ language (Hungarian) when young, but she later wanted to learn and is now fluent, and her own kids can speak some too. Thank you for your follow-up thoughts. My reference to “easygoing” wasn’t about parents speaking the minority language and children responding in the majority language. I was emphasizing the stage prior to that, during the first few formative years, when parents have the best chance of “conditioning” their children to communicate with them in the minority language once they begin to speak. My main point is that the situation where the child is responding in the majority language can potentially be avoided entirely if parents are sufficiently proactive from the very start. By mindfully shaping the circumstances, and the outcome, parents will be practicing the sort of “preventive medicine” that I describe in What Frustrates Me About Raising Bilingual Children. But when new parents err on the side of being too “easygoing” about their efforts, they will likely lower the odds of achieving that aim of “conditioning” their children to actively use the minority language. I do not know that my case is related to this topic or not but I appreciate you if you share your experience in this area. My son was normal until age 4, he could speak, play and communicate with other kids, and after that some symptoms of Autism appeared gradually. The biggest issue was losing his speaking ability. I should mention that we moved to USA when my son was 3 years old. We spoke Persian at home and English outside. Amin, without knowing the circumstances in more detail, it’s naturally difficult for me to comment. If you haven’t already, I recommend that you consult with relevant professionals, including a specialist in autism and a speech-language pathologist. And I would encourage you to find professionals in these fields who have experience working with bilingual children. Can Children with Special Needs Be Bilingual? I wish I could be more helpful, but I send my best wishes to you and I hope that your son receives the support he needs. I have three children I have raised thus: I speak only Swedish with them, and when they speak to me if they throw in an English word I query them until they use the right word (i.e. in Swedish ‘Did you mean apple or orange?” so they end up saying the right word without me making them say the word). This strict approach has led to them all speaking fluent Swedish in Australia. They were born here and so was I. My question is, they currently have a high need for the language (to communicate with me) but one thing our family misses out on is family conversations. At the dinner table they speak Swedish to me and my husband feels very left out. I feel our family is missing out by not being able to have family conversations, but if I make an exception and mummy speaks English at the dinner table, am I opening the floodgates? I was thinking I could compromise, they are starting a Swedish class for a few hours hopefully every week, which will help their reading and writing a lot. I’ve also gotten more movies, music, and endeavour to read more books. I’m afraid that if I speak English at the dinner table they will speak more and more English with me and each other. However, at the same time, I am strict and would not respond to English away from the dinner table. They already know I speak English, obviously as I speak it constantly with my husband. Another thing is that currently, if I speak English to MY parents it feels very strange and foreign (we spoke only Swedish with them growing up). So hence I only speak Swedish to them (English feels weird), the exception being group conversations where my husband is there or other family Australian spouses. I wanted English to feel foreign for my kids to speak to me (as it currently does) because it reinforces the need for Swedish, but I am also thinking that me speaking English at the dinner table will eventually normalise English between me and my kids because they are starting young, and will also result in them using it more often. Lisa, yes, this is tricky: leading a “normal” lifestyle as a family, with a shared language for communication, while not wanting to undermine the children’s need to continue actively using the minority language. There’s no “right” answer, of course, because so much depends on the age of the child, how well “conditioned” the child already is to using the minority language, and other family circumstances. In general, I do think that there’s less “danger” in undermining the minority language as children get older and their “conditioning” in that language is firm. When parents bring up this issue, and yet the child is still very small, I recommend caution: it might be best to handle the situation more strictly for at least a while longer. It sounds like your children are older now, and doing well in Swedish, so perhaps you could “test the waters” gradually by, for instance, starting with a special “English-only” dinner on Saturday evenings (while emphasizing the “rule” that outside of these meals, they must continue to speak Swedish with you). If this is a success, and you don’t see any signs of backsliding on their use of Swedish, then the number of “English-only” meals could slowly grow as you continue to monitor their reactions. Lisa, I’ll keep my fingers crossed for you! Let us know what happens! Adam, thank you so much for this website! I found it while trying to find a solution for my own dilemma – I hope you won’t mind me asking a question. Here’s our situation: I’m German, my husband’s American and we live in Germany with our 18 month old son. I generally speak German to our son, however, since my husband doesn’t speak any German at all, we speak English when we’re all together. “One language, one parent” just doesn’t work for us. My son understands both of us, but prefers certain words (e.g. he always uses the word ‘goat’ even though he understands the German word ‘Ziege’). Now here’s my question: will it be a problem for him to hear me switch languages all the time? For instance, if we’re home and I speak German to him but switch to English as soon as Daddy comes home? Also, I’ve noticed that I’m having a hard time not repeating the words in the language my son uses – he’ll say ‘goat’, and I’ll say ‘yes, it’s a goat’ in English instead of answering in German. I don’t want to confuse the boy. Ivy, I hope this site will continue to be a source of support throughout your bilingual journey. As for your situation, I don’t think you need to be concerned. In fact, because it sounds like your husband isn’t able to spend as much time with your son, it would certainly raise the odds of success if you can add to his minority language exposure by using some English, too. As long as you maintain reasonably distinct “domains of use”—you generally use German when you’re alone with your son and English when the family is all together—I don’t expect he’ll feel any sort of “confusion.” Just continue to be as consistent as you can and make sure that he’s receiving sufficient input in English. The fact that you live in Germany, where English is taught well and is widely spoken, is also to your advantage. I think your son has a bright, bilingual future! Thank you for your website. Very useful, though I am stuck in the following situation. I am French and the mother of our 2 and a half year old is Greek. We live in Greece. I always address my son in French. He is advanced in language skills and speaks Greek well and understands French very well. However, he never speaks a word in French back to me. I, as I said, speak only French to him but reply to him in French only when he speaks to me in Greek, still we never had a conversation in French only. He goes to the extent of translating my own French words in Greek. We spent 2 weeks in France at his grandparents, I told him to call his grandparents ‘Papy and Mamie’, he translated in Greek as ‘Papou and yaya’ and kept calling them that way for 2 weeks. PS: I and my wife speak often in English for practical reasons. He does like repeating words in English when he hears them, but never when hearing French words unless they are funny in his own sense. What should I do to make him speak French? Keep up your daily efforts, Yves! (Make sure you’re reading aloud to him each day and have ample resources in French.) I’m cheering for you! I cannot be more delighted than that and I want to stress to all other parents to keep going, all the work is not in vain in my opinion. A trick that I used was to deny the existence of what he said in Greek or in his ‘home made’ language’ he was distilling from his mind and let him know that I did not understand. This stopped him somehow. Now, I have a question related to English as I and my partner speak English between us. Our son has a major interest in English obviously hearing a lot of it and he asked me to see this ‘Caillou’ series in English. He is learning from it. I am trying to limit it until he enhances his skills in the other 2 languages first. What should I do now with the English keeping in mind that I want him to speak in the future? My idea would be to switch to English as a family house language when he is reaching 5 to English. Does it make any sense or is it very much a ‘crazy’ idea. Yves, many thanks for your update. I’m really happy for you and your son. Your persistence and patience is paying off, and your advice for other parents to follow your persevering example is exactly right. As for your son’s third language, English, I would say that as long as his exposure to English doesn’t undercut his exposure to French, then this would be productive input. (Since you live in Greece, and I assume he will attend local schools, his Greek isn’t a concern.) If you can maintain strong exposure to French, while increasing his input in English, then I expect this will be helpful for his trilingual development. About eventually shifting toward the use of English as a family, I think time will tell. It’s not at all a “crazy” idea, but whether or not it would be an effective choice for him, and for the family, very much depends on the conditions at that particular time. So it’s fine to hold this possibility in mind, but it would best to discuss this with your wife and son at that later stage. I’ll continue cheering for your trilingual success, Yves! And I look forward to hearing more good news from you in the future! Hello again. I just hope that you carry on your blog as before. I thought that it would be interesting to give you an update. My son is now 4.25 years old. Greek and French aren’t a problem. Of course, he has a memory challenge on knowing all words. I am trying to expand as much vocabulary as possible without pressure. 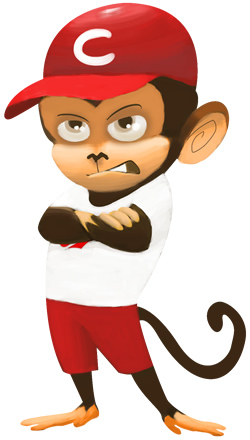 Sometimes he ‘stutters’ or more exactly looking for the right word when addressing to one or another parent. It must be difficult and I cannot judge as I have never been in that position. I recommend three excellent materials for learning languages as they are available in English and French are Caillou (Canadian) series from 3 years old and then Monsieur Madame from Roger Hargreaves that is funny and stimulating in terms of emotions. The last only in English is Little Baby Bum (LBB) on Youtube. Great songs for toddlers. As for the English (the language that we parents speak at home), he understands (sometimes too much for hiding surprises) English and sings many LBB songs in front of the screen. English does not interfere yet and we keep going doing the same. When it comes to alphabet songs, we have a challenge but then again, it is a memory challenge and also a comprehension of the world he lives in. For example, reading the word ‘???? ?’ in upper case Greek; the ? lambda is read as an upside down V. He can decipher the letters upside down anyway and I am not surprise by the confusion. I am the French mother of a little 2 and half year old girl and have been living nearly 10 years in the UK. My husband is native British and I am perfectly fluent to the point where I find it easier to communicate in English. Anyway, when my little girl turned 6 months we moved out to Turkey for my husband’s work who is a chef and does very long days at work so she spent 2 years with me at home speaking 85 percent of the time French as I knew we’ll get back to the UK sooner rather than later and she would then be exposed to English with school and family. I have now moved back to the UK and have only recently noticed how even 6 weeks after having moved back, she addresses children in French or replies to adults in French, even to her dad. Since we are here, I mainly speak English to her but I guess my husband being so little present is an issue. Moreover, he speaks French well enough and I think that’s why she replies to him in French, his dad’s mother is French. She’s seen recently my husband’s parents who both speak decent French and seem to not notice they reply in French to her but with a lot of grammatical mistakes which bothers me. My question is where shall I start and will she adapt because she’ll grow in the country of her minority language? Will it be quicker than being in a non English speaking country or her brain will process it slowly no matter where she lives? Pauline, if your daughter will now grow up in the UK and be schooled in English, your longer-term challenge isn’t really her acquisition of English, it’s her sustainable development of French. Because her English will progress just fine once she enters a school setting, and even grow dominant over the years ahead, I would advise continuing to speak French to her. In other words, I think you’ll achieve better success, in the long run, if you use French consistently in your communication. To fortify her French even further, you could simply make French your family’s language, with your husband using French, too (the “minority language at home” approach). In any event, as the main minority language speaker, you may gradually undermine her exposure and need for French if you actively use English, too. I send my best bilingual wishes from Japan to the UK! Thanks so much for your quick reply. I have never thought about it that way. It makes a lot of sense to me and I will definitely follow your advice on making French her home language. Pauline, happy holidays back to you! I look forward to hearing good news from you in 2016! My husband and I both speak English and Spanish and we live in the US. Both of us learned some Spanish as children but grew up speaking mainly English and then worked on improving our Spanish skills as adults. Our daughter is 2 years old and we have been speaking almost entirely Spanish at home since she was 1. She is advanced with her language skills and speaks in Spanish very well. She was attending an English speaking daycare up until a few weeks ago, but she didn’t seem to learn much English there. Recently, we got a long-awaited spot in a Spanish speaking daycare and our daughter has started attending. Now, if someone tries to speak to her in English (like my siblings) she gets angry and will even shout “No!” My question is, should we start exposing her to more English as well, maybe by introducing English time at home? Part of our goal was to raise her as a “better bilingual” than we were, but she is definitely monolingual now. And she will attend kindergarten in English eventually and I don’t want it to be a complete shock. Ilana, it sounds like your bilingual journey is off to a very strong start. I applaud you and your husband on your proactive efforts to support your daughter’s Spanish side. As for her budding English, I understand your concern. Over the long run, acquiring English won’t really be an issue, since her exposure to the majority language, through schooling and society, will eventually grow heavy. I’ve worked with many children, of kindergarten age and beyond, who had no English ability when they entered the international school where I once taught, and they all gradually gained good proficiency in this language, without any lasting stress. That said, it’s also true that you could help ease her entry into school and the wider community by gradually increasing her input. Ideally, though, I would be conservative about the amount of English exposure you provide, and it would be better for this exposure to come from other speakers and sources, not from you and your husband. Although it sounds like she’s becoming firmly “conditioned” to use Spanish with you both, this potentially could change if she comes to feel a lack of “need” to continue communicating with you in Spanish. I can’t, of course, predict exactly what would happen if you and/or your husband began using English more while she’s still small, but I believe it’s best to err on the side of caution during these early, formative years and fortify her Spanish side as much as you can before English becomes a more dominant part of her life. A strong head start to the minority language is very helpful for the larger arc of a child’s bilingual development. I wish you all the best, Ilana, and look forward to hearing more good news from you as time goes by! I am bilingual, and my parents used a very simple method with me. If I said anything in the majority language, I would be requested to speak in the minority language and would not get a response till I did so. And I knew perfectly well that my mother spoke, and was more comfortable in, the majority language, her native tongue. But their method was so successful that to this day, we always switch to the minority language for matters of the heart. Catjy, thank you for sharing your family’s success. This approach is well worth trying, though its effectiveness will naturally depend on the particular parents and children involved. For families that end up experiencing a clash of wills, they would be wise to address the difficulty in other ways so the parent-child bond isn’t adversely affected. What a great article! It is good to know that there are others out there with this problem. I’m the British Dad of 3-year-old twin girls living in Mexico, my wife is Mexican and speaks good English, but we spend a lot of time with my in-laws who only speak Spanish and although the girls understand me perfectly, they won’t reply to me in English, probably because they know I speak Spanish. We read to them in English and they watch films and TV programmes in English too. We will be going to England soon to visit my parents and I hope that will help them with Need and Exposure to the language. I was wondering whether ability in the minority language is something that might develop naturally over time and that the reason they don’t use it now is because it is just going to take them a little longer to get there. I hope so, anyway this article and the comments have given me food for thought and I wanted to say thanks! Paul, I’m glad this article is useful to your efforts. I don’t know the details of your home life, but if your wife is also comfortable speaking English, I would urge her to use more English with the children, too. In fact, if you’re largely the only source of exposure to English—and your kids don’t feel a real need to communicate with you in this language—then I’m afraid the odds will continue to be against their active use. This situation could even become more challenging as they get older, enter school, and their Spanish grows increasingly dominant. So I recommend an “intervention” now, while they’re still small, and gently reshape your use of languages at home so you can approximate the “minority language at home” approach, where both parents are consistently using the minority language—with the children and with each other—as fully as possible. At the same time, you should build up your resources in the minority language (especially books) and establish firm habits and routines (like reading aloud each day) to promote their development and use of English. All the best to you and your family, Paul! And have a fun, fruitful trip to England! I live in English environment though English is my second language. I have a 3.5 years old son who is going to English preschool. I speak only my native language with son and my husband at home, but can’t limit myself to not using some English words. Sometimes it’s hard or not possible to say something in my native language, so I use an English word for that. I also read books every day to my son. He likes books a lot, and I to read him a lot. The only thing is, since he likes books and I do not have enough books in my native language, I often read him English books (which are easy to buy, or just borrow from library) in my native language by translating them myself while reading. I do it a lot, so it’s not causing me any inconvenience, it just comes naturally. But I am worried that it will negatively affect language learning, since I am not a professional translator. It’s been bothering me for some time. Any advice would be appreciated. Lana, it sounds like you’re making good efforts to nurture your son’s ability in the minority language. It’s only natural that you can’t avoid using English completely, yet the more you can consciously emphasize the minority language and “de-emphasize” the majority language, the more progress you’ll likely experience. As for translating books into the minority language, this is a useful tactic when the supply of books in your target language is limited. The important thing is reading aloud to him persistently, not the “professionalism” of your translation, so don’t let this concern you. Just continue doing your best because I’m sure your best is fine for providing this vital language input. Keep going, Lana! You can do it! Hi Lana, I think you are doing the right thing by talking to your child in your native language. We use our native language at home & my 6 year old child attends an English medium school. So, in the evening about 2 hours, I speak to him in English mainly when I help his school work. I read English story books to him before bed time too. However he sometimes talks to us in English so if it is we reply him in English too. We meet our relatives/friends who speak our native language. We also have mom & kids meet ups, b’day parties etc with his English speaking friends mainly during school holidays. I can say he’s catching up both languages well. I am just starting a Thesis on Bilingual children (of expats/immigrants) with a focus on why they stop speaking one of the languages. My parents moved to an English speaking country when I was 7 (and already fluent in their native language, Portuguese) and did everything possible to make sure that we would not lose the language. I did not know a single word of English and was put right into an English class upon arrival (the immigrant children were given some extra ESL classes a couple of times a week…I was in this class for 4 months and after the summer holidays was told I did not need to return). In our house Portuguese was the only language ‘allowed’. My parents also had us attend Portuguese night classes and made sure we were involved in activities in the Portuguese community (there was and is a big Portuguese community where they moved) as well as spending summers every few years in Portugal with family. Aside from watching television and doing our school work in English, any other use of the language at home was frowned upon. I must admit, however, that my siblings and I started using English during our play time and when we addressed each other, which we still do to this day. I do not remember exactly when this started happening as when we moved (and did not yet speak any English) we only spoke to each other in Portuguese but now we are all in our early 30’s and feel ‘weird’ speaking to each other in Portuguese. I have been teaching English in Spain for a few years now and have been approached by expat parents asking if they should also start speaking Spanish to their children at home or what to do, as their child no longer wants to use English at home (after having started at a Spanish school). I am hoping to gain some more insight into this world of bilingualism and having come across your page I look forward to reading what you have found through your experience. Thank you in advance. Monica, thank you for your comment. I enjoyed reading your story about your personal bilingual upbringing and I applaud both you and your parents on the proactive efforts that were made to hand down the minority language to your generation. I wish you the very best with your thesis and I hope my blog and my forum can be a source of support to your project. Please also feel free to share my work with your circle in Spain as I believe they would find helpful information and encouragement at Bilingual Monkeys and The Bilingual Zoo. I am now really getting down to working on my thesis (mentioned above) and was hoping to possibly contact some parents of the bilingual children who stopped speaking one of the languages and I was wondering if it would be ok for me to try to reply to/contact some of the comments from parents who have found themselves in this situation so as to possibly include them in my ‘studies’. Any and all help would be kindly appreciated/useful. What a wonderful site. I have a 5 year old son who is attending pre-primary. We communicate at home in our native language, English is our minor language. Both my children are bilingual. However my 5 year old refuses to speak at school (English is the school language) and it has been almost 5 months. He communicates non-verbally with his friends and teachers. He laughs at the the teachers jokes, plays with his classmates, he loves going to school. He fully understands them but refuses to talk to them. When we are at home he will use English words in the right context. His sentences will consist of more or less 70% English words and the other 30% is our native language. He even sound and read his sight words and reading books. As soon as we are between people he communicates non-verbally as if he has no confidence in speaking English. I have also tried to speak to him in English at home but he tells me to stop speaking English. His sister also plays with him in English but he answers her back in our native language. We have done playdates etc but nothing seems to work… I am in desperate need of help…any suggestions? *What is your native language? Do both you and your husband use this language with your children? *How has your son developed ability in English? How active is this ability, really? *Has your son attended school before? *What do his teachers say about the situation? For the moment, let me just offer that it’s quite normal for children to experience a “silent period” when they enter a school environment and don’t know that language well, or don’t yet feel comfortable using it actively. As a teacher at Hiroshima International School, I witnessed this many times, and yes, this “silent period” can last for months. If your son is happy at the school, and the teachers aren’t concerned about him, then I suspect that patience will win out and he—like all the children I’ve seen in this situation—will eventually start using English more actively when he’s ready to do so, according to his own internal timetable. As his mother, your worry is only natural, but I wonder if it’s needed, and in fact, if it may even be complicating this process by putting unnecessary pressure on him to bloom before he’s able, when he’s still in the stage of growing more capable and confident. After all, we don’t expect a flower to bloom before it’s ready, right? Well, your son is a flower and his growth needs the same sort of patience. If my hunch about the situation is correct (and there are no other extenuating circumstances), this means that, a year from now, when he’s speaking English more actively at school, you’ll look back and wonder why such concern was even felt. We live in Australia, been here for 9 years, both children were born here. We speak Afrikaans at home with each other and with children. He has been in a daycare since 8 months, he could eventually communicate to his carers using key words – like a toddler would do, but he knew them since 8 months. We moved to another town (100km away from our town) when he was 3 years 6 months. Before we moved he was able to speak English. He went to a daycare (preschool) in our new town but it took him 3 months to start talking to his teacher. With regards to our move, he really enjoys living in the new town. The school psychologist thought he had selective mutism but he doesn’t show any anxiety to go to school (during morning drop off after we have completed his morning challenge before his class start he will greet me and even instruct me to go. He mingles and plays with his friends. When he calls his friends he whistles to them. The school psychologist told me that he makes noises etc but he is not using any words. We are already half way through the academic year and I am really worried. Maryke, thank you for the additional details. Again, I understand your concern, but unless there are further issues I’m unaware of, I continue to suspect that this is a “silent period” that will eventually resolve itself in time once he feels comfortable enough to use his English ability at school. I don’t think his willingness to use the language should be rushed, since putting pressure on him to speak may only add to his discomfort and his resistance. *Hiring a suitable person, like a playful college student, to come to your house on a regular basis to play with your son in English. Since this person won’t be able to speak Afrikaans, I expect your son will slowly crawl out of his shell to communicate in English. But, again, it’s important that he view this as “playtime”; it should not feel like “school” or “tutoring”. *Inviting a friend (or friends) from school over to your house to play. As with the older “playmate,” this more intimate setting will hopefully encourage him to use English more actively. Maryke, I look forward to hearing good news from you in the not-too-distant future! Thank you for this great article and blog. I read it when I was pregnant and it was very useful. I’m French, living in the US with my Chinese-American husband (who is fluent in Chinese, understands a little bit of French). We communicate in English. I have a 2 year old son who so far speaks French to me and English (and a little French) to his dad (I’m truly amazed). My concern is that I speak English to my husband so I’m afraid my son will prefer speaking English because it will be obvious I speak English. He goes to an American daycare and will go to American school and weekend French school when he is older. I read a lot in French but he’s getting more and more English books as gifts. The English books are nice and rhyme. Should I translate them to French not perfectly or should I read them in English? I’m afraid he’ll start speaking to me in English if I read the books as is. Our current baby sitter is a lovely American and we don’t get a baby sitter often but would it be better to find a French one? Thank you so much for your bilingual wisdom! Pascale, I hope my work can continue to be an encouraging source of support for your bilingual journey. Basically, because your son’s exposure to English will grow increasingly heavy, the more you can mindfully and proactively exert control over his language input where you can—particularly when it comes to your own language use—the more success you’ll likely experience over time. In other words (this is something I often stress), do your best to emphasize the minority language while “de-emphasizing” the majority language. This means that every small choice and action you make counts toward the larger goal of fostering active ability in French that can be sustained beyond these early years. There’s nothing “wrong,” of course, with speaking English regularly to your son (or around your son), or reading English books, or using an English-speaking babysitter instead of a French-speaking babysitter, but these choices and actions don’t effectively support your greater aim for his French side. On the contrary, the more liberally you use English, or provide English input, the higher the risk that his “need” to use French with you will become undermined, particularly once he begins more formal schooling. I’m cheering for you, Pascale! All the best to you and your family! Great website and book! Thanks for trying to organise the chaos of bilingual information out there. My son is almost 4 now. When he was 3.5 we moved to Mexico temporarily and I lost the pretense of not speaking Spanish since often in front of him I have to communicate with grandparents, other family members including kids, vendors etc. Also, when we play with other kids, although most of the time I address him in the minority language (Greek), I then switch to Spanish for their benefit. He seems to understand me perfectly as I even ask him to translate things to his cousin for example but refuses to speak. Even on his own invention of a game that would get us to switch languages he still doesn’t do that (but seems to be aware of the issue since he invented this game). I suppose down the line if we change context he’ll be forced again but I wonder if there are any strategies to make him talk to me in Greek. I do pretend sometimes I don’t get a word or phrase but then he is stuck saying that he doesn’t know how to say it in Greek (even if I say the same thing he’d translate it!). It all started when I had to be 3 weeks away and of course because of his nursery and cousins he is always communicating in Spanish so that reinforced Spanish. The odd thing is that he’ll tell guests etc. that I don’t speak Spanish but he speaks to me in Spanish. Sometimes our communication is so seamless (me Greek, him Spanish) that I think he doesn’t even understand that he speaks Spanish to me. Any thoughts what to do, or just wait for the summer in Greece? About your situation, the big bright side is that your son’s understanding of Greek is strong so his active use of the language isn’t far behind. However, in order for that to occur, the two “core conditions” of exposure and need must be fortified. That will certainly happen, as you suggest, when you’re able to spend time in Greece. Actually, you mentioned moving to Mexico “temporarily” so I’m not sure if you’ll be returning to Greece again soon, on a permanent basis, or not. If so, his Greek will catch up quickly once you’re back there and so this spurt in Spanish is probably a good thing for the larger arc of his bilingual development. Manos, I wish you and your family much success and joy for 2017 and beyond! Hello, my husband and I are both English speaking Americans but have been living in Portugal since before our children were born. Our two kids have been in Portuguese schools since they were six months old. Although my older daughter is fully bilingual and functioning very well in first grade, my younger son (age 3.5) actually stopped speaking Portuguese and only speaks English. He understands everything that is said to him in Portuguese and is able to communicate with friends and teachers at school using a little English, body language and an expressive face but will barely say a word in Portuguese. Both kids switched schools in September when we came back from a month in the States and that is when his boycott became clear. He doesn’t seem unhappy at school and is actually quite a popular kid but I worry that if he doesn’t get back to speaking he will miss out on valuable personal connections with other kids. The teachers after my initial request to only speak in Portuguese with him have changed tactics and are letting him speak English and even go to the English class with the other preschoolers once a week with the aim of getting him comfortable and hoping that with time he will decide to speak on his own again. This is an unusual situation since it’s the majority language… Any advice is welcome. I’ve witnessed this sort of situation as a teacher myself, and heard about it from other families, and in all cases the child eventually comes to speak the school language quite freely. I send my best bilingual wishes from Japan to Portugal! My name is Sabine. My husband and I are native French speakers. We moved to US three years ago. Our son was born in US and went to a daycare until 2 years and a half. During that time, I spoke to him part in English and part in French. Not really having any discipline or methodology about it. At 2 years and a half my son had already difficulties speaking both languages, not putting a sentence of 3 words together. We moved from US to Spain 6 months ago. Now my son is 3 years old. As I’m a home stay mom at the moment, I decided to help him as much as possible. During the past 6 months (as my husband is gone most of the time) I’m in charge of keeping up both languages: one parent, 2 languages…what a challenge. Now I’m speaking to him only French and for one hour per day (reading stories, bath time) I speak in English. – After 6 months of “one on one” there is no interaction yet. My son doesn’t communicate much. – His first language would be English but he knows only words. – Am I doing right to speak French, the minority language most of the time and only specific activities in English? – When he talks to me in English (broken English) should I correct or complete his sentence and then ask him to repeat in French? Any comments on a single parent who is trying to keep up both languages and simple tips on how to manage daily activities (do and don’t). Sabine, I understand your concern about your son’s language development. And I’m afraid the circumstances you describe are very challenging. My first suggestion would be to read this article very carefully. I think you need to make sure that no other developmental issues are hindering your son’s language acquisition and use. If no other developmental issues are present, the main problem seems to be the lack of sustained exposure to a single language. In other words, your son’s first few years have been marked by a “split” of two (or more) languages and the input in each hasn’t yet been sufficient to produce much active language ability. It isn’t clear to me how well he understands French and English, but if his comprehension is generally good, then this is largely a challenge of proactively increasing his input to both languages through the many ways I describe at this blog, at my forum, and in my book. It seems to me, though, that French should be your higher priority, since you and your husband are French natives, your extended family is (I assume) French, your husband is unable to offer much regular language input, and you’re not currently living in a French-speaking environment. I understand your desire to continue providing support for your son’s English side, too, but if time spent on English is undercutting the “core conditions” of exposure and need when it comes to French, it might be better for you to focus exclusively on French and seek out another person to provide him with English input. My main advice, then, would be to strengthen your son’s daily exposure in French, and his need to use it, and if English interferes with this aim, then reach out for support, like an English-speaking babysitter or tutor, instead of continuing to take on both languages by yourself. The hard fact is, it can be very difficult for anyone, without regular support from a spouse or others, to divide their limited daily hours between two languages and provide the child with adequate input in both. Thank you for your answer. I find your website and the blog posts very informative and helpful as a parent. Your reply and the link to the guest post are very useful to have a better understanding of the situation. You are right when you say need and exposure. For the first two years my son didn’t get good exposure (working mom from 8-5pm ) so 2 hours per day speaking to him was not enough. I will follow your advice and talk to my son only in French (forget his reading time in English) until he can build up his language ability. 4 or 5 years old? As well, he will be going to a French school instead starting next September. I hope that will boost his ability to speak. Then we’ll see if I can reintroduce English. Quick question: at 3 years old, all colors are “red”…it doesn’t matter how many times we play and I show him the different colors. Any thoughts ? PS: I ordered your book and I’m looking forward to reading it. Sabine, you’re very welcome. I’m glad that my response, and my work in general, can be helpful to you. As you emphasize French more at home, and as your son becomes immersed in French at school, I expect you’ll see strong and steady progress in his French ability. And I don’t think his early start in English will be “lost”. He clearly has begun to acquire this language, too, and that foundation can continue to be built upon, by you and by others, through the rest of his childhood. So this strategy of emphasizing French can be seen as a short-term need for his longer bilingual development. When his French is more competent and confident (maybe in a year or so), you could again give more energy to his English side. As for using the word “red” to label all colors, this sounds like a case of “overgeneralizing,” which is common among small children in their language and cognitive development. In other words, I suspect he’s temporarily using the word “red” to mean “color” of any kind. Have patience with this (and perhaps try playful ways of nurturing color recognition, through books and games) and I’m sure he’ll begin to differentiate, and name, the individual colors as time passes. I look forward to hearing good news from you in the future! Thank you for this article. I love to use music in the car, makes it easy and fun. I usually choose a couple of songs and include them in our playlist, then I add more little by little. When it’s a new language, or they are for some reason rejecting the target language, I wouldn’t recommend playing a full album at once. I live in Israel but I am Dutch. I live in a small town where I’m the only source of Dutch available for my children. With my husband and my mother-in-law I speak English. Until my daughter went to kindergarten the Hebrew/Dutch speaking was more or less 50/50 but since she started going to kindergarten her Hebrew took a huge flight. Besides the fact that she now speaks 90 Hebrew 10 Dutch, also her ability and language skills increased like hell. She is now 2 years and 5 months and speaks in Hebrew flowing sentences with passed tenses, differentiates male-female and knows plural singular. All of this after two months of school. Amazing of course but…no Dutch. Until now I speak to her 95% in Dutch 5% Hebrew. Obviously I really need to cut it out with the Hebrew; it’s hard it goes automatically. When she speaks to me in Dutch until now I always answered her. In Dutch of course but I did answer, so she knows I understand. I don’t know if I need to start telling her: I don’t understand can you say that in Dutch and then if she doesn’t show her how to and ask to repeat. Or without saying I don’t get it just to repeat her question in Dutch and answer in Dutch. Or to make her repeat after me. My Hebrew is not very good so soon enough there will be a time where I won’t understand her for real. Even though I sometimes think probably then she will be sparked to speak in Dutch I sometimes fear she will just not believe me and I will end up not understanding my own children. The whole thing makes me quite anxious and sad. I just don’t know what is the right thing to do at this point and it’s very important to me to be able to communicate to her and my now 4-month-old son in my own language since I don’t know Hebrew well enough also. Dutch is kind of the only thing I have: this HAS to work out!!! Please help me. Renee, I understand your concern and I’ll do my very best to be helpful to you so that you children can make more effective progress in Dutch. My most important suggestion, if this is at all possible, would be to reshape your circumstances so that you and your children can spend more time together during these early formative years of their bilingual development. I don’t know the details of the situation (why your daughter is already attending school, how many hours she’s there each day, etc. ), but if the balance of her language exposure continues to be heavily weighted toward Hebrew, then I’m afraid you will continue to experience this sort of imbalance in her progress and in her ability. Without more exposure to Dutch on a daily basis, it will be hard for your children to develop the kind of active ability that you desire. As their Hebrew grows stronger and stronger, their Dutch will likely become more passive. In other words, you will speak Dutch to them, and they may comprehend much of what you say, but they will have difficulty replying in Dutch because their ability in Hebrew has grown dominant. So, above all, I urge you to somehow reshape the basic circumstances of your situation so that you are more effectively addressing the most important condition for successfully fostering active ability in the target language: your children must receive ample exposure to this language on a daily basis, and especially during the first few formative years of their lives. You see, if you reshape these circumstances, and can provide more ample input in Dutch while better controlling (limiting) their exposure to Hebrew, your children will naturally develop stronger and more active ability in Dutch. The “smaller tactics” that involve getting them to use the language with you, instead of Hebrew, will become less necessary (though they will continue to be useful). No, the concern now is Dutch and, if you feel that Dutch is vital to your life as a family, then you must take the necessary actions to make Dutch a higher priority in your life and in your children’s lives. If you do, and if you remain as proactive as possible about this aim throughout their childhood, then you will surely experience a lot of satisfying success over the months and years ahead. Finally, I would also encourage you to join me and hundreds of other parents at my forum, The Bilingual Zoo. It’s a really warm, empathetic community and the best way to receive ongoing support, not only from me but from many other parents with experience and ideas. I’m cheering for you, Renee! Please stay in touch and let me know how you’re doing and how I can help! Thank you for the insights from this blog. In my situation, I’m American (English-lang, Irish) and my son is half Vietnamese; we live in Little Saigon, USA. He is turning 4 and English is definitely his preferred language, and his mother is the primary caregiver. She reinforces Vietnamese but he prefers English. I recently started to try to learn Vietnamese to encourage his use of Vietnamese here, and I’m getting pushback from him when I say anything in Vietnamese. He wants me to speak English (that’s all Daddy has ever spoken). I really want to encourage his use of Vietnamese and at the same time don’t want him to pick up any of my bad grammar/pronunciation as I learn Vietnamese. Andy, I commend your efforts to support your wife in nurturing your son’s Vietnamese side. Even if you’re unable to add substantially to the Vietnamese input he’s receiving, you’re setting an important example in terms of your willingness to actively use the language. While the pushback you’re getting is no doubt frustrating, it’s only natural, considering that the bond you share has been formed in English. But if you (playfully) persist past this short-term resistance, your commitment to Vietnamese will surely benefit both of you over the long-term future. And I wouldn’t worry about him picking up “unnatural” usage from you. As long as he’s also receiving ample input from your wife and other sources of exposure (I imagine such sources are available in your location) this exposure to “standard models” of Vietnamese will ensure that he acquires native-like ability over the months and years ahead. But again, the main thing, really, is generating that ample input in Vietnamese, and particularly during these early years. The more proactive you and your wife can be about providing, and arranging for, rich language exposure, the more progress he will make. Andy, I send my best bilingual wishes to you and your family! Please keep at it, day by day!